Come and discover the Yelloh! Village La Petite Camargue in Languedoc-Roussillon, beside the Mediterranean! Heated aquatic area and Jacuzzi, restaurant, grocer's, bodega etc. You'll find high-quality facilities and all the comfort you need for enjoying a great camping holiday with your family or friends. 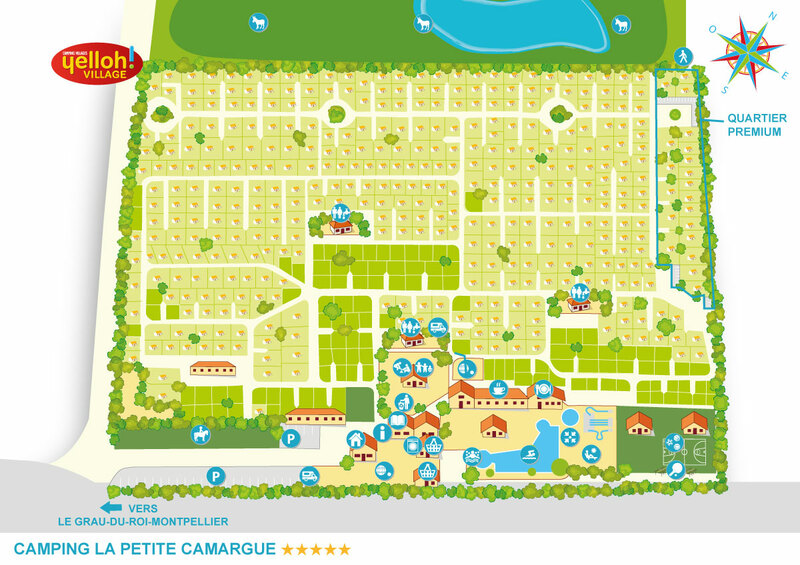 At the camping La Petite Camargue, your holiday will be full of long, sun-drenched days! Come and enjoy a wide choice of entertainment and watersports & sports activities, giving people of all ages plenty to do. So why not choose this distinctive and wild countryside region during your next camping holiday in Languedoc Roussillon! Why not choose a campsite in the Camargue for your next Mediterranean holiday! With the sea, a lake and salt marshes, come and discover the camping La Petite Camargue in Languedoc-Roussillon. If you're keen on history, the city of Nîmes will certainly satisfy your thirst for knowledge! With the Maison Carrée, amphitheatres, the remains of the city’s Roman walls and plenty more, come and discover this city and its treasures! Well-known for its famous Féria bullfighting festivals, you'll be able to just go with the flow and be part of this event. The Camargue has all sorts of surprises in store for you: come and spend an afternoon finding out about its traditions and watching its traditional events, with Ferrade, Courses Camarguaises, the entry to the city on horseback and more. This passionate land with its bulls and horses living side-by-side is a whole new world for you to come and discover. With your family, you'll be able to walk in the footsteps of Louis IX, go around the ramparts of Aigues-Mortes and enjoy breathtaking views. And not far from there, come and take a stroll along the huge, fine sand beaches and watch the sunset, or take advantage of the various watersports activities available, including catamarans, windsurfers, kitesurfers, pedalos, boat trips and fishing outings. So come and enjoy your next holiday in the Camargue with your family or friends as soon as you can!